The Federal Court of Appeal sitting in Abuja, Friday, has upheld the election of Senate Minority Leader, Sen. Godswill Akpabio as the duly elected senator representing Akwa Ibom North-West District in the March 28 national polls. 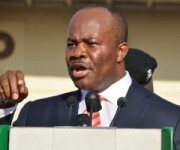 Contrary to some online reports, the appellate court in its ruling held that Akpabio was duly nominated by the Peoples Democratic Party (PDP) and thus elected. Meanwhile, Appeal Court sitting in Abuja, has sacked two National Assembly members of the Peoples Democratic Party IPDP) from Rivers State. The Court of Appeal sitting in Abuja, Thursday, sacked Senator George Thompson Sekibo and two others with the All Progressives Congress (APC ) candidates having all its appeals upheld. The sacked senator had been representing Rivers East Senatorial District in the National Assembly since 1999. At the 7th National Assembly, Sekibo was Chairman, Committee on Defence. He was considered very close to former President Goodluck Jonathan and his wife, Patience, and so, wielded much influence. Sekibo was not the only casualty of the appeals filed by candidates of All Progressives Congress (APC). Also thrown out of the National Assembly by the Court of Appeal, Thursday was Hon. Blessing Nsiegbe. Nsiegbe, until her removal, had represented Port Harcourt Constituency 2 in the Federal House of Representatives under PDP ticket. A top PDP source has described Sekibo’s sack as “shocking”. The source said that Sekibo’s loss was unexpected. “We are in shock over Senator George Sekibo’s loss at the Court of Appeal. We had considered his matter as one of those already in our kitty. Now that he has been sacked, it means we are not sure of anything,” the source said. The Court had ordered that fresh elections be conducted within 90 days by the Independent National Electoral Commission (INEC), in the affected senatorial district and Federal Constituency in Rivers state all the cases in favour of APC. Also, the Court of Appeal delivered judgment on the following National Assembly Elections Petitions Appeals and the following appeals were upheld, elections of the PDP NASS members nullified and INEC ordered to conduct fresh elections within 90 days. It has been a clean sweep for APC, while Senator Magnus Abe (APC) and Senator Olaka Wogu for Rivers South East would be adjudicated, Friday, December 11 at the Court of Appeal.